On July 16, 2017, Minnie O. Free Thompson went home to her Heavenly Father. Minnie was born Jan. 25, 1924, to David Greenwood Free and Arleavie E. White Free. She was born and raised in Marthaville. Services and viewing will be at Jenning’s Chapel, 368 Hwy 1221, Marthaville, Wednesday, July 19 from 5-8 p.m. Services will be Thursday, July 20 at 10 a.m. Burial to follow in Bethany Cemetery. She is survived by two sons, William “Billy” H. Thompson Jr. and wife Mary, and Delbert H. Thompson Sr.; and Daughters-in-law, Kathy Thompson and Beverly Thompson. Also mourning her passing are Kathie Landry, Shelia Barbo and Lana Thompson. 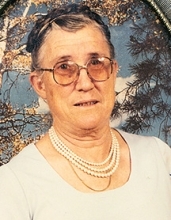 She leaves 15 grandchildren; 23 great-grandchildren; two great-great-grandchildren; two sisters, Elizabeth (Beck) McAnelly and Mary Ann Weeks (C.W. ); sister-inlaw, Edrith Free; and numerous nieces and nephews. She was preceded in death by her father and mother, David G. Free and Arleavie W. Free; husband, William H. Thompson Sr.; and sons, Jimmy R. Thompson, John A. Thompson, Clyde G. Thompson and Robert C. Thompson (Bobby); and a granddaughter, Tracy T. Williamson. Minnie was one of a kind. She was a loving wife, mother, grandmother and sister. She was loved by those who knew her.Those honored to be pallbearers include Billy Thompson, Delbert Thompson, Johnny Thompson, Clyde Thompson II, Delbert Thompson Jr. and Kevin Thompson. Honorary pallbearers include Jimmy Thompson, Martin Thompson, Chad Thompson, Nathan Thompson and Jake Bradford.